I am a beginner. Now I am relearning anything I thought I had acquired. Though I love the art form and have an aptitude for it, I’m not the least bit adept. I don’t have the skill sets and techniques on auto pilot as the advanced students or master teachers do. Among other highly demanding things, the teachers must know and be able to execute every design in the entire curriculum backwards so that students may view their demonstrations from the front. Luckily I have some sensitivity to the Japanese aesthetic and desired form, but I’ve got a long way to go to develop my eye. A few millimeters makes all the difference between oh yes and nope, not quite. I can see it after it’s corrected, but I can’t always see what’s needed—not yet. I have everything to learn about the manipulation of plant materials to achieve the desired form. 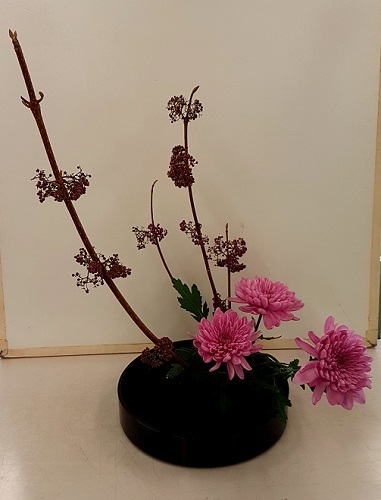 Though I had wonderful tuition from my Vancouver teacher, Mrs. Sally Yukawa, and was fortunate to use authentic materials she was able to take in season from the Japanese gardens of her friends in Richmond, I’ve barely begun. I know this. And I don’t mind. I’m where I am and going from there, learning more each day with joy. Think about learning to play the piano. A beginner starts with C-major scale and stumbles through “Twinkle, Twinkle Little Star” based on the French song “Ah, vous dirai-je, Maman.” However, a master teacher knows all the scales—major, minor, modal, chromatic—as well as Mozart’s 12 variations on that Twinkle Twinkle theme—and so much more in the piano repertoire. A master executes that flawlessly from memory. In addition, that master stays honed with practice, practice, practice and more practice. Every day the routine is the same. 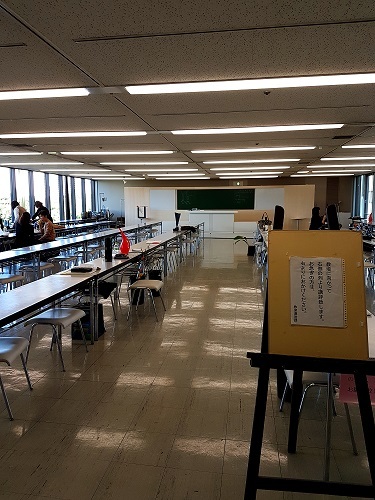 Students enter, take a number, register and pay for the lesson in order, receive a yellow ticket, choose their materials and then hand in their yellow ticket. There’s an art to getting a low number and being among the first to snag the best blooms and branches, too. Once they have their materials, students work at their individual lessons while the teacher and assistants monitor and, if necessary, advise and correct their progress. After an hour the master teacher offers a demonstration. 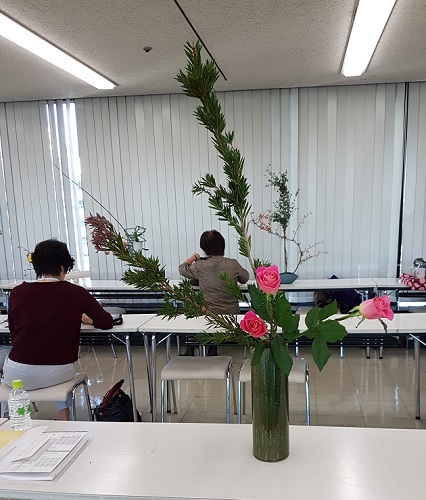 Although it’s a rare occurrence, once in a while it’s heartening to see how it’s handled when a branch refuses to conform to the master teacher’s wishes or a blossom plops out of an arrangement just as mine did repeatedly one day this week. Of course, I know I’m the kid who’s been asked to perform “Twinkle Twinkle” for the adults who all cringe a little but clap and cheer. Never mind. I’ll choose to feel a little chuffed. I’ve worked for it. I’ll take the bow. 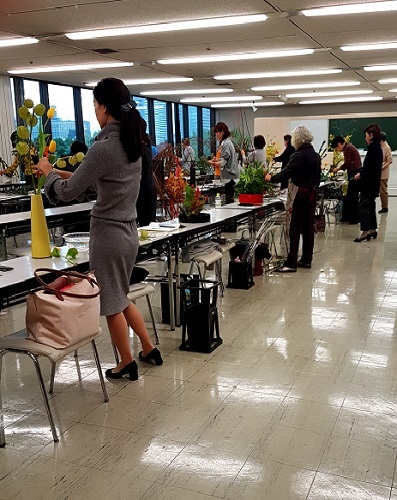 This entry was posted in Japan, Travel & Culture and tagged A beginner in Sogetsu Ikebana studies, Studying Sogetsu Ikebana in Tokyo. Bookmark the permalink. Bless you, Pat. I always appreciate knowing that something I have created is a pleasure for others.